Oxo fruit tools make life so much easier – so make a Pineapple Upside Down Cake Batter Snow Cone! Your kids will crown you queen of the snow cones! Whenever I travel by plane, I always worry about one thing. What do I worry about before, during the flight, and after we get in the taxi? Water. As in, where am I going to get it? I don’t like tap water. The only place I will willingly drink tap water is at my parents house. The water is drinkable, tastes good, and unlike here in Sacramento, you don’t have to chew it. Anyway. When I travel, I want to go to the store and get a gallon jug of water. I want to refill the one (or two) bottles I bought at the airport (that’s the first thing everyone buys past security, right?) and I want to have enough of it to drink all day, every day of my trip. I know, it’s a phobia. It pairs well with my fear of checking luggage and my fear of being late to the airport. And my fear of overpriced hotel water. Oh, and my fear of walking barefoot through security. Everyone carries socks in their carry-on, right? You could say I have issues. Water issues, especially. When I’m at home, I love to use my water wisely. You know, like in snow cones. Have you ever had a cake batter snow cone? No? Well, it’s a good thing I made one for you then. There’s a little snow cone stand near where I live, and they have tons of cool snow cone flavors. My BFF Hayley introduced us to them last summer. I can’t wait to start going again this year. But what happens when you are craving cake batter snow cones but you can’t go buy one? 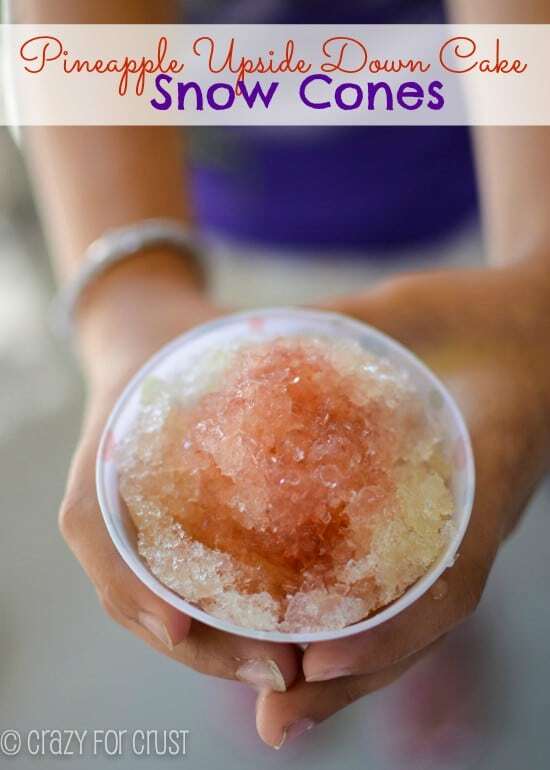 Have you ever made snow cone syrup at home? It’s super easy. Really, it’s simple syrup (sugar and water) with flavoring. I made cake batter by adding vanilla and butter extracts. And sprinkles! But I didn’t stop there. I made you a Pineapple Upside Down Cake Snow Cone too! Thanks to Oxo’s Blogger Outreach Program, I got to try out some fun new Oxo tools perfect for summer. The Cherry Pitter and the Ratcheting Pineapple Slicer are my two favorites. How do you actually pit a cherry without a tool? I tried the straw thing last year and OMG. Red juice everywhere! And don’t get me started on slicing pineapple. It’s annoying. 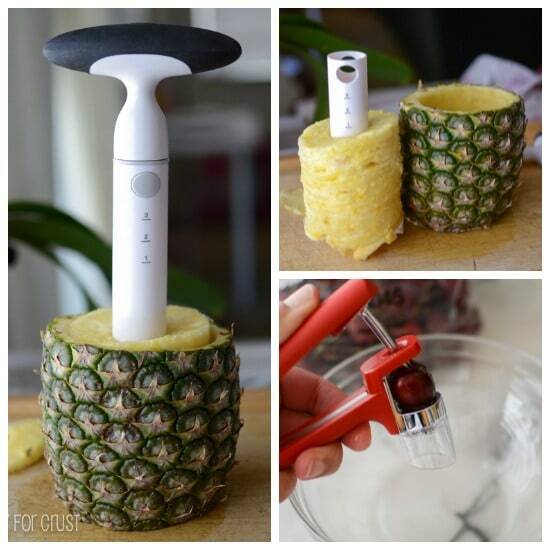 This tool, while a little tricky to get started, slices the pineapple in perfect rings. It kind of blows your mind a little, if I’m being honest. So, what to do with cherries and pineapple? I think I’ve shown that I don’t just eat fruit. I make sugary desserts out of fruit. Otherwise, what’s the point? All you do is make a simple syrup with the cherry juice and the pineapple juice. And voila! You have snow cone syrup! Layer the snow cones with the cake batter, pineapple and cherry to make Pineapple Upside Down Cake. Make pineapple cake. Or cherry cake. It’s way fun for summer. And your kids will love you, really. Snow cones are magical to kids. Kind of like water jugs are to me. Or, the fact I only bought one bottle of water in Austin. That’s why I love conferences: free water! 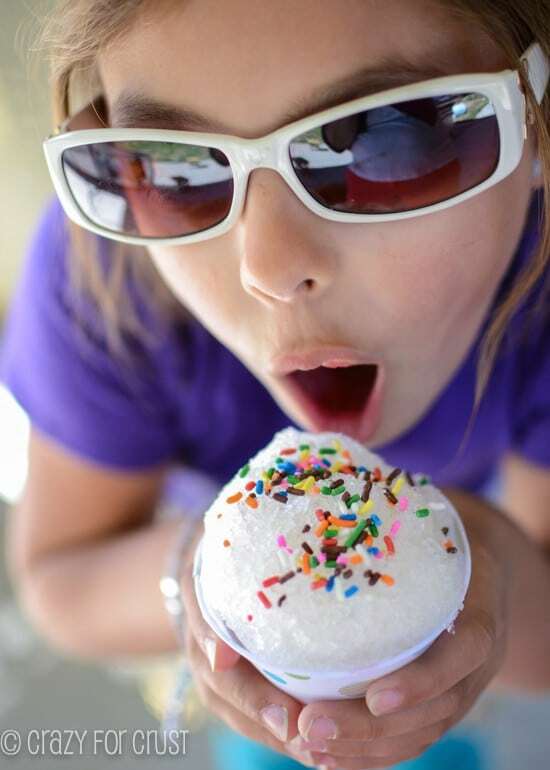 Find all my favorite funfetti recipes here. Make cake batter simple syrup for snow cones - then turn it into a pineapple upside down cake snow cone! To make the cake syrup: Boil water and sugar over medium heat until the sugar is dissolved and mixture is clear. Remove from heat and stir in both extracts. Transfer to a jar and let cool completely before using (best if chilled overnight in the refrigerator). To make the Pineapple syrup: Puree the pineapple chunks in a blender. Place in a medium saucepan with water and sugar. Cook until boiling. Remove from heat and strain into a measuring cup. Strain a second time into a jar. Let cool completely before using (best if chilled overnight in the refrigerator). To make the Cherry Syrup: Puree the cherries in a blender, adding a dash of water as needed to make the blender run. Strain into a measuring cup. Rinse strainer and strain a second time into your saucepan. Add water and sugar and cook over medium heat until boiling. Remove from heat and place in a jar. Let cool completely before using (best if chilled overnight in the refrigerator). 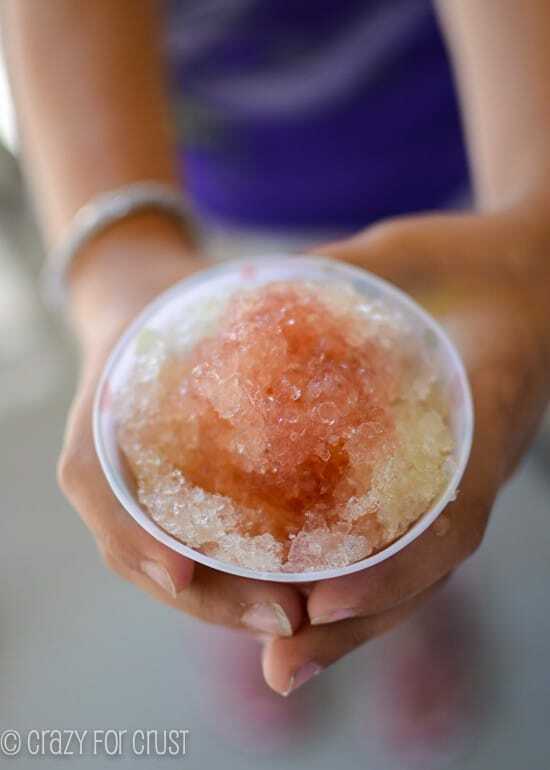 To make your snow cones: add shaved ice to a cup or snow cone paper container. 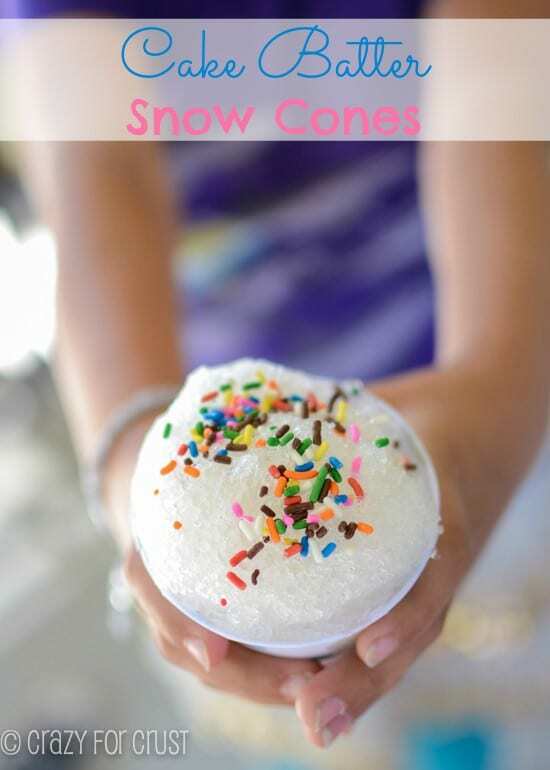 For cake batter snow cone, pour syrup over ice and top with sprinkles. For Pineapple Upside Down Cake snow cone, pour cake batter syrup over the ice, then top with pineapple and a dash of cherry. As part of their blogger outreach program, Oxo sent me some tools to try. I was not compensated for this post and all opinions are 100% my own. These look & sounds so yummy & refreshing! That is so awesome! I had no idea it was so simple to make the syrup for snow cones! And cake batter flavored – love love! Why thank you for making me a snow cone!! How sweet of you! 😉 These look fantastically yummy! I love all your traveling quirks Dorothy! Helps me keep my mind of my own worries 🙂 I seriously can’t believe you only bough one bottle of water in Austin! So, snow cones huh? This is so freaking awesome I can hardly believe and those OXO tools – SO COOL! If we come up you totally need to make these for the boys. I can make requests right?? 🙂 Now go to Disneyland already! I’m in love with these Snow Cones! My kids literally ask for them daily…. (we have a snow cone maker sitting in our cabinet from Christmas)….they will go CRAZY for these flavored syrups! This is seriously the best idea! My kids will love you for it, too! I HAVE TO try this Snow Cone! YUMMO!! I just need to know though, what the heck is Butter Emulsion? I did a Google search and still have no idea what that is. Thanks for sharing! I LOVE the idea of making my own “cake batter” syrup, but I am wondering if there is any way to get the butter flavor in the syrup from a product that does not contain Propylene Glycol? Does anyone know of a concentrated butter flavor without Propylene Glycol? I really, really want to try this! I’m not sure what brands contain that or not, but possibly an organic or natural brand? I know there are lots of extract brands out there. Possibly one they sell at whole foods? Maybe an oil instead of an extract? Otherwise you could use cake mix, but I assume that has chemicals in it too, probably worse than the extract! ps- is butter extract just melted butter? I’ve never seen butter extract! Thank you! Butter extract is like vanilla, but it’s butter flavored. You can buy it at most stores with all the extracts!